I’m a snacker. I could eat the most amazing meals all day long but still feel lost without something salty to munch on in-between. This, unfortunately, does not always make it easy to stay in the same pant size, if you know what I’m saying. I have a tendency to blissfully eat an entire bag of chips at times before stopping to think “I will probably regret this a lot”. So what do I do to prevent myself from spiraling into post-snacking shame? 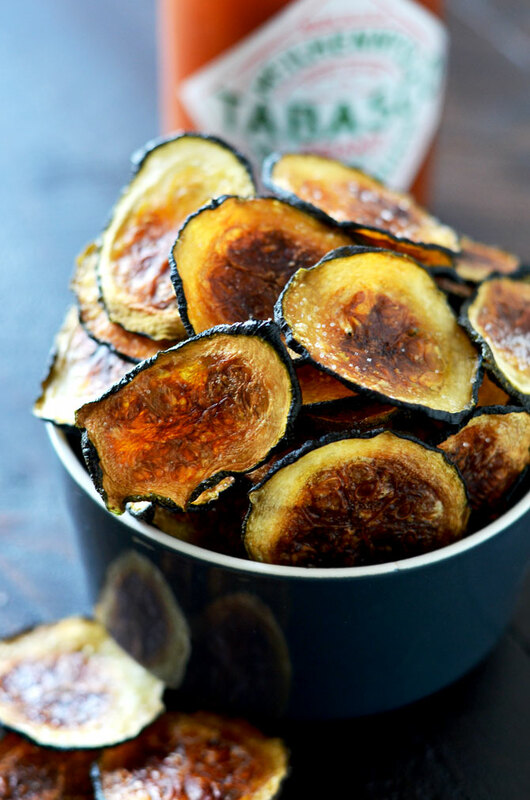 I make healthier snacks without sacrificing any flavor, because let’s be honest, if they’re not delicious, I’m not eating them. 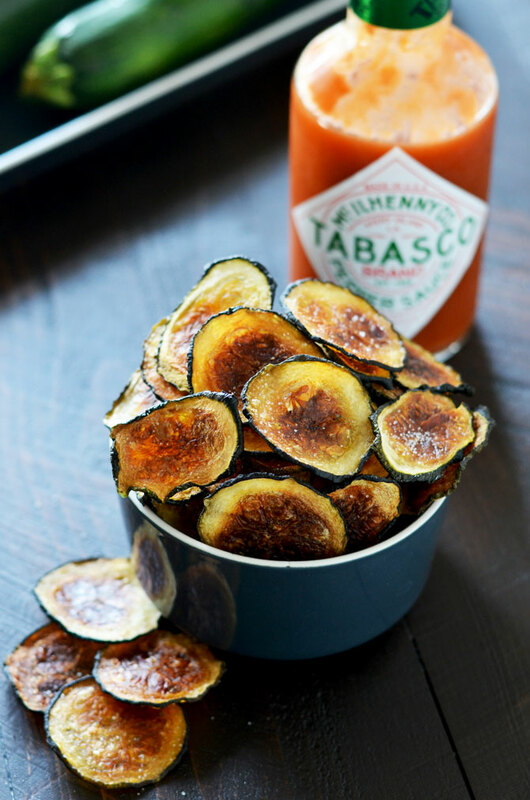 My new favorite is Crispy Tabasco Zucchini Chips, which are brushed with spicy Tabasco and baked– yes, baked– until crunchy and browned. They. Are. Delicious. 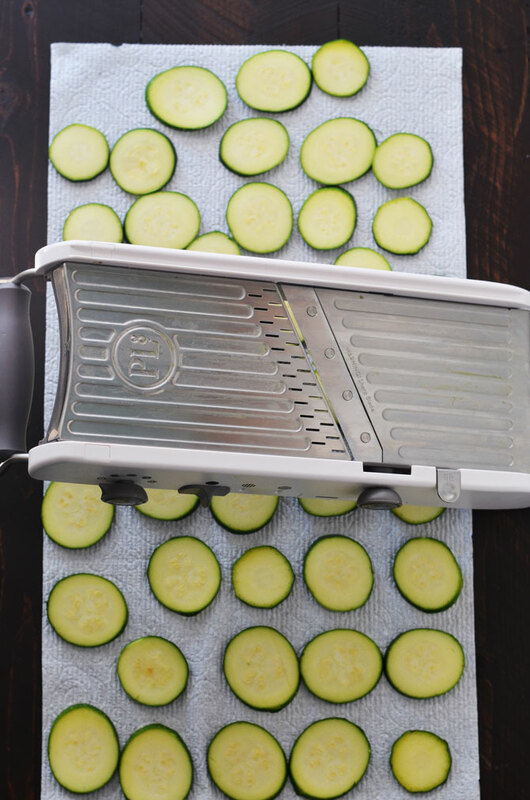 In order to get the zucchini chips to crisp up evenly, I used my PL8 Mandoline to slice my zucchini to an even thickness. Then I pressed out the excess moisture 3 times using paper towels. It’s important to really press out all of the water you can, or else the zucchini chips will wind up soft! Then I brushed them lightly with a mixture of Tabasco sauce and olive oil before throwing them in the oven to bake on very low heat for a few hours. 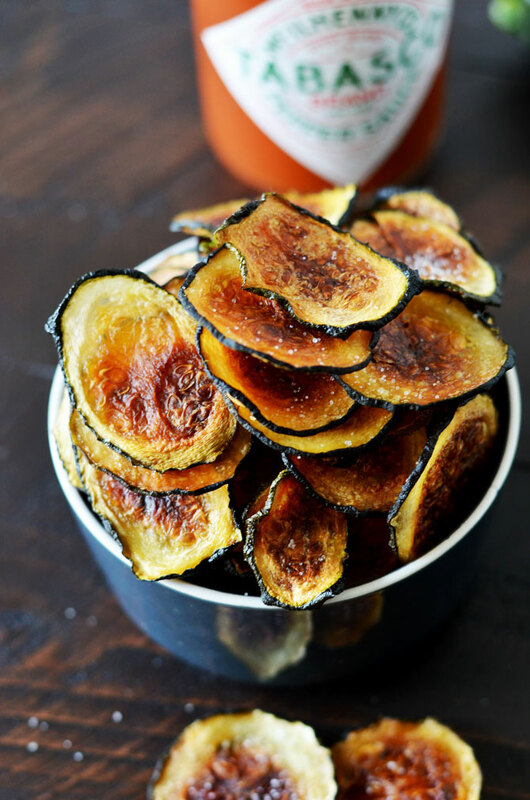 The low heat oven almost acts as a dehydrator, so it takes a while, but in the end the zucchini chips come out perfectly crisp! 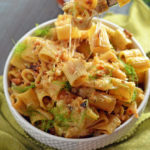 I decided to make it even more interesting and try to make a recipe each for breakfast, lunch, snack, appetizer, and dinner. For breakfast, I made Spicy Egg Clouds in Ciabatta Boats. For lunch, I made Chipotle Chicken Fried Rice. 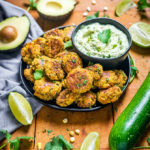 These Crispy Tabasco Zucchini Chips are my snack recipe, and you’ll just have to check back to see the appetizer and dinner recipes to come! When you try these, don’t forget to take a photo and tag #hostthetoast on Instagram or Twitter! 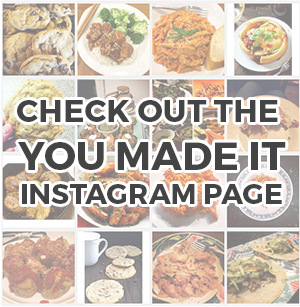 Can’t wait to see yours! 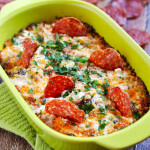 Preheat the oven to 225 degrees F. Line 2 baking sheets with parchment paper and set aside. 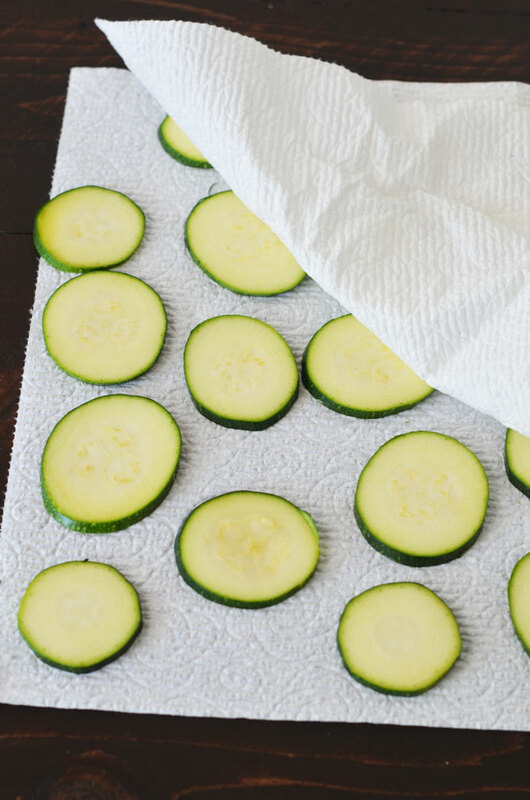 Press the zucchini slices firmly between sheets of paper towels. Do this 3 times to press out as much water as possible. 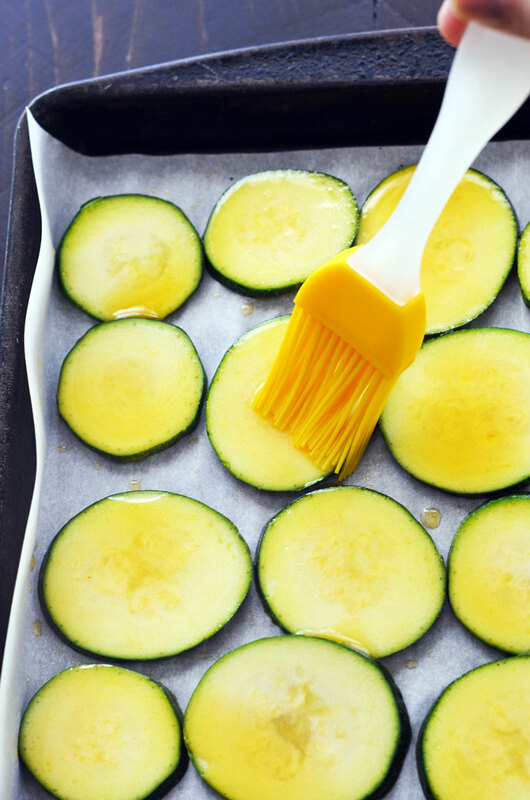 Place the zucchini slices in a single layer on the baking sheets. Use additional baking sheets if necessary. 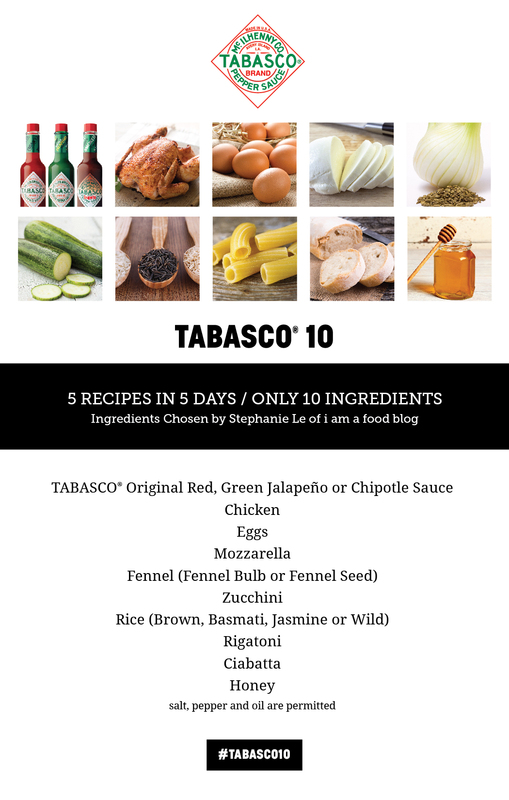 In a small bowl, mix together the olive oil and the Tabasco. Brush the mixture onto the tops of the zucchini slices, lightly. Too much oil will prevent them from crisping up. Arrange the baking sheets in the oven and cook for 2 1/2 hours or until golden brown and crisped, turning half-way through. If your zucchini do not fully crisp up, press them again with paper towels to remove any excess moisture and return to the oven until crisp. Oh wow! 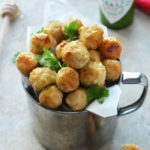 I am and always will be a snacker, and I could eat a whole bowl of these. Pinning!